This is not a regular port guide like you would expect of Cruise Crocodile. However since a lot of cruise ship make the journey through the Suez Canal we feel like you want to have that extra information on your transit through the canal. 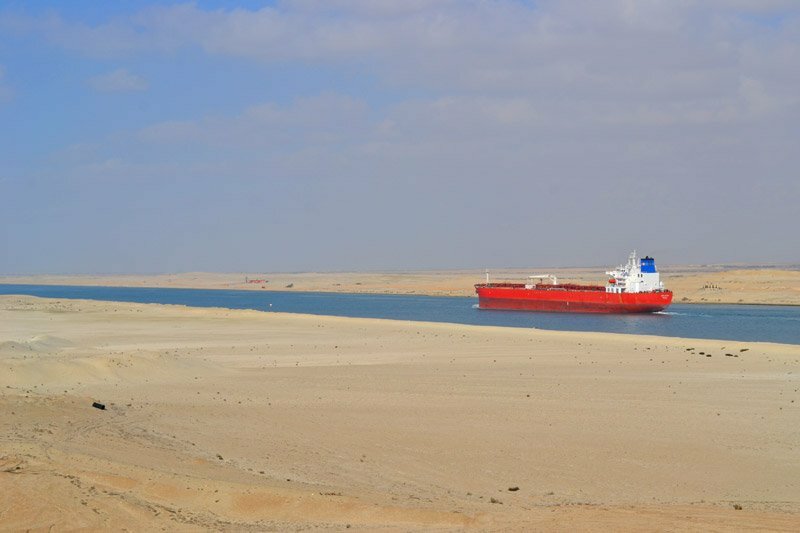 In this guide you will find all the information you need about your Suez Canal Transit. The Suez Canal is a canal that would make the world a smaller place upon its opening in 1896. The canal is considered to be the shortest link between the east and the west due to its unique geographic location. It is an artificial sea-level waterway that connections the Mediterranean Sea and the Red Sea. It allows ships to avoid the long route around Africa making the journey from Europe to Asia about 40% or 5000 mile shorter. The canal is 193 km / 102 miles long, depending on the way you measure it. A transit through the canal is different every time. There are lots of circumstances that vary every single day. Here are the basics of what you want to know about your transit. Just recently the new Suez Canal was finished. Which means ships no longer have to sail in convoy. Therefore cruise ships are now able to guarantee day transits. Officially every ship has to use 4 pilots for the transit, although often less are used depending on the transit. 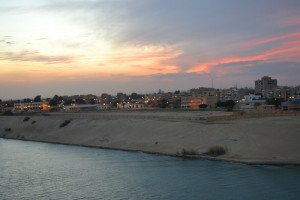 There are no locks in the Suez Canal, because the water level of the Mediterranean and the Red Sea are basically equal. Sea water flows freely through the canal. The tidal range is 65 cm in the north and 1.9 meter in the south. All ships are allowed to go through the canal with an average speed of 8 knots. This is to protect the banks of the canal from waves generated by the ships. Canal length 193 km / 102 mile. To be honest with you: a transit through the canal by cruise ship will not be the most exciting day of your life. There are limited things to see along the way because most of the time you will sail on a narrow strip of water in the middle of the desert, but that is also the beauty of it. In general you will find that the east of the canal is completely dominated by the vast desert. West of the canal is where you will see a fresh water canal and some small houses along side. See the map and text underneath to find out what there is to see while cruising the Suez Canal. A. Statue of liberty Did you know the statue of liberty was originally planned to be at the entrance of the Suez canal. Sculptor Barthaldi fell in love with Egypt and in 1869 he presented a blueprint of a giant statue. The statue was originally meant to look like an Arab peasant and her flame was to symbolise the light she was bringing to Asia. Unfortunately Egypt couldn’t finance the statue and we all know the rest of that story. B. Port Said This is where you will find the entrance of the Suez Canal. It is a charming town that has a real European feel to it. Most buildings are in French Colonial style. When sailing into Port Said from the Mediterranean sea you will first meet the long break waters, than the colonial district of Port Said followed by its large industrial harbour and than the never ending Egyptian desert. C. El Ferdan Railway Bridge 20 km north of Ismailia you will find the El Ferdan Railway Bridge. It was completed in 200. With a span of 340 meter, 1100 ft it is the longest swing span bridge in the world. D. Ismalia This is the half-way point of the canal. Ismailia has a population of about 700.000. The town was named after Khedive Ismail, a man greatly involved in the creating of the canal. The director of the Suez Canal Company, Ferdinand de Lesseps, also lived here until the completion of the canal. 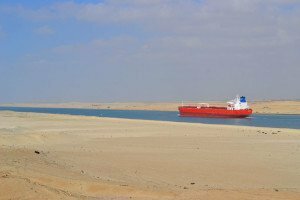 A lot of the business involved in daily operation of the Suez Canal is taken care of here in Ismalia. Often a new pilot is brought on board here. Also try to spot the war memorials on the side of the canal here. E. Lake Timsah This lake is also known as crocodile lake. Timsah is perhaps the most important historical and geographical location of the Suez Canal. It is a connection in the current canal, but was also a juncture for the ancient canals build thousands of years ago. To provide the labourers with fresh water during the construction of the Suez Canal a channel was dug from the Nile to Lake Timsah. Also this is officially where the Mediterranean and Red Sea meet. F. Suez Canal Defence Monument At Ismalia your ship will pass this impressive monument. It is a 50 meter high, 240 meter long granite building, designed by the French. It was erected to commemorate the defence of the Canal from the Turkish Army in the first World War. G. Great bitter lakes What used to be a dry salt valley is nowadays the biggest canal along the Suez canal. The Great Bitter Lake was the site of the Quincy Agreement. Franklin Roosevelt, Winston Churchill, Joseph Stalin and King Abdulaziz met on board the USS Quincy in a meeting that nowadays is known as the Quincy Agreement. H. Yellow fleet In June of 1967 15 ships were in transit through the canal when war broke out between Israel en Egypt (the six-day war). Both ends of the canal were closed and the result was that 15 ships were stuck in the canal for a total of 8 years. The fleet is referred to as the yellow fleet because of their yellow appearance due to the desert sand. I. Suez At the southern entrance of the canal we find the town of Suez. It has about half a million inhabitants. Every strong civilisation has always seen the spot of Suez as an important geographical point. In the 25th century BC the 6th Pharaonic dynasty used the city to protect the Eastern part of the country from invasions, but also this is also a connecting part of the canal the Egyptians previous build.